For an average individual having a Guinness world record title under his/her name sounds impossible. For an extraordinary person it becomes possible. But, what if I say someone can have hat trick in world records? You feel thrilled and you hesitate to believe right? Narayan Bhattarai. 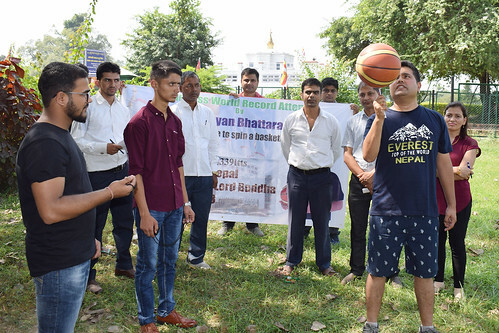 A Guiness world record champion on longest time to spin a basketball on one finger (using one hand ), has made two more successful world record attempts on longest time to spin a basketball on pencil tip and longest time to spin a swiss ball on one finger using one hand. 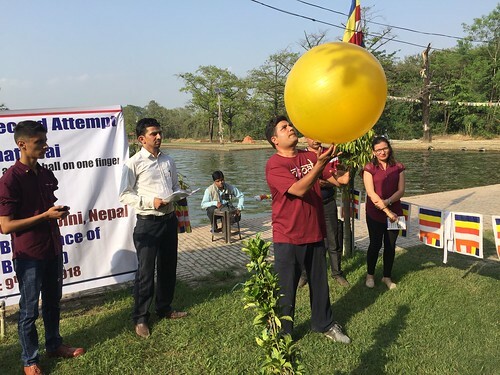 On 9th October 2018 in Lumbini, the birthplace of Gautam Buddha he made two successful world record attempts. In the morning he successfully spun a basketball with a pencil tip for 29 minutes and 25 Seconds, breaking earlier record of 1 minute 21 seconds. In the afternoon of that very same day he spun a swiss ball with one hand one finger and continuously for 16 minutes 9 seconds (Average) breaking the earlier record of 5 minutes 38 seconds. 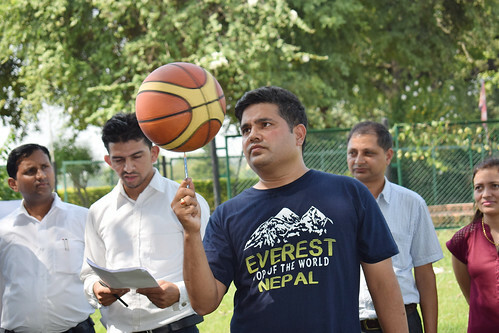 When Mr. Bhattarai was calmingly and confidently spinning balls both the basketball and the swiss ball, national and international pilgrims and local people were viewing his attempts with surprising and thrilled gesture. Narayan Bhattarai is a pharmacist residing in Imadol Lalitpur. He has a Guinness world record title on longest time to spin a basketball on finger (using one hand). This time he has made two more successful record attempts – once these attempts are officially verified he will have hat-trick in world records.